This album's been on the blogosphere before, but I wanted to get a full quality rip up here. When Barack Obama gave his nomination speech the other day, much was made of the fact that it fell on the 45th anniversary of Martin Luther King's famous Washington speech, and many were moved to think about the progress that had been made in the intervening years. 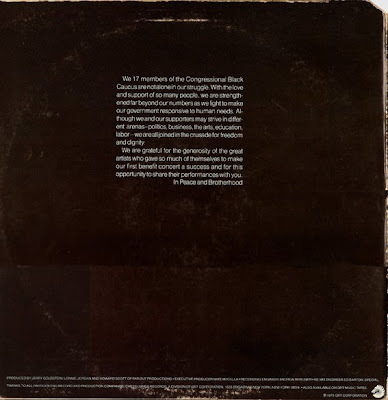 This album comes about a decade into that progress : In January 1969, newly elected African American representatives of the 77th U.S. Congress joined six incumbents to form the "Democratic Select Committee". 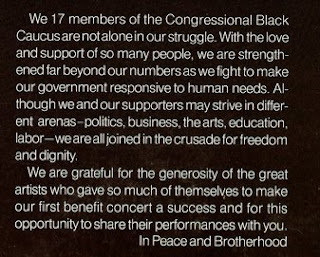 In 1971 the Committee was renamed the Congressional Black Caucus. This is a great funky album, capturing everyone at the top of their game. After a series of crowd "Amen! "s for the artists, Kool and the Gang kick off with a thirteen minute version of the jazzy instrumental "Wild and Peaceful" , the title track from their 1973 album rhodes, flute and a sax solo that builds and sustains. Curtis Mayfield comes in with a version of "Give Me Your Love" from "Superfly". The announcer tells us he'd just released the album "Sweet Exorcist". 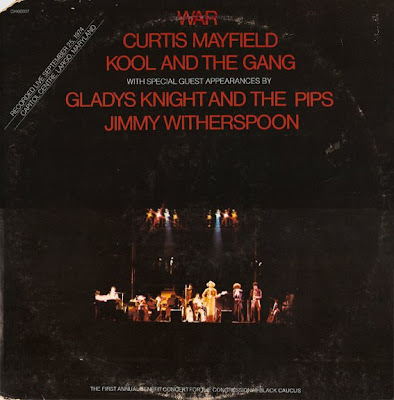 It's great to hear Mayfield live in this mid-70s period - as good as his 1971 live album is, this 1974 band is tight. 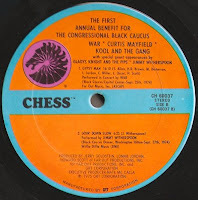 Gladys Knight tells us that she and the Pips had just completed the soundtrack for the film "Claudine" with Mayfield, and they launch into a version of that albums's funkiest track "On and On", written by Mayfield. War members Howard Johnson and Lonnie Jordan produced this album along with Jerry Goldstein. Bluesman Jimmy Witherspoon completes the proceedings with an intimate version of "Goin' Down Slow", with a sudden breakout guitar solo from Robben Ford. So enjoy this album, and don't be fooled by "pro-life" hockey moms, support Obama in '08! 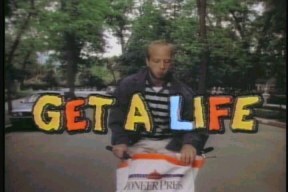 Produced by Howard Scott , Jerry Goldstein , Lonnie Jordan for Far Out Productions Inc. and GRT Corporation. You already know I've left a collection of comments on what you've posted previously. That's all for Mayfield's version of Gimme Your Love!! As a matter of fact, this message is being sent to you from the after-life.......... I'm already in heaven. I did not even know about this, but a live "Wild and Peaceful" at 13 minutes! THANK YOU!!! Man Simon666 I must say you have like the best blog on the net. This is deep music that you post. Stuff for your mind, Keep it up! I'm in complete awe of the generosity of this. It's beautiful music from first note to the last. Big love from Blaxploitationpride! MANY THANKS SIMON FOR A SUPERB POSTING-PART OF BLACK MUSIC HISTORY! First Mark II, now this. Great stuff, Simon. Thanks for both. Very cool. I'd never heard of this, but am excited to hear it. Thanks. 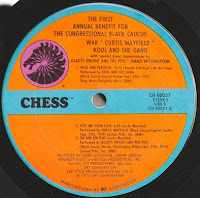 being a huge Curtis fan and early War too btw, I must say I'm thrilled to have a chance to hear these versions...I expect that "Wattstax" kinda vibe, I guess. Thanks as big as the world and everything on it! -you had any chance of listening to that Kiruna yet? Emile : Still have to get into work to download (slowed here another three days), will be onto it soon! The Shamek Farrah files come from CD, like the Ware files, and thus are aiff files - all the vinyl rips (like this one) have been created as wav files. As noted before, I didn't specifically add the .aiff extension on those two CD rips, so this may need to be done. * Could someone recommend for Oui a PC program that reads/converts aiff files to WAV ? Always thank you sooo much. This YAMAHA'S freeware is able to convert from Aiff to Wav, from Wav to Aiff. I wish your problem to be a solution by this. back from a long vacation away from the Net and what do I find but numerous massive posts -- including this gem. Props for this. Thanks so much. Thanks again, Simon. After hearing it at a mate's some years back, I've been keeping my eye out for this one. Love the play-by-play review. I've noticed recently that a lot of .aiff files made w/ iTunes or Garage Band can not be converted to .wav w/o those same software apps. Never had a problem with the format until the emergence of iPods. I'll try El Goog's solution but so far I've just had to steer clear of .aiff files altogether. Thanks again for comments guys. Cheeba, Re the AIFF problem - I didn't use those apps - for the two problem albums (Leon Ware's "Rocking You Eternally" and Shamek Farrah's "First Impressions") I just dragged the tracks off CDs, and they come up marked as AIFF on my comp. Many thx. This Is so great. Wonderfull. Thank You Very Much!!! Ages ago I mentioned another live date with an odd combination of acts and a terrific live version of War's "Gypsy Man." I was finally going to put it up on my blog when I discovered it's already up elsewhere. Anyway, the album is an odd hodgepodge but don't miss the Willie Bobo and the awesome Gypsy Man. Hmmm. Not only is the "Live at Watts" version as good as the one Simon's offering here, I believe it's exactly the same! So which album is lying? Watts 1973 or Maryland 1974? Other opinions? Thanks for sharing, can't wait to give it a try. BTW: Mediafire link 1 seems to be down. I know this is a long shot here, but is there anyway to re-up the links? I used to have this LP on vinyl, lost it along the way somehow and thought I'd never see it ever again. But low and behold, your awesome blog had it at one point. Thanks in advance. I'm getting a little afraid that my blog is under attack. Someone's deleted the uploads for my latest post, and now this one. I will upload at some stage, but am too busy right now. Leave a comment with a blogger account to be informed. Thanks Simon. I'll login with a blogger account to see what's up. Again, I thank you. I'm logged in with a blogger account (I believe). Just wondering what's up? Same here - would love to see this. Oh, this would be so nice to have - can you reup please? Thanks! Love your blog. Pff if it would be possible to re-upload this, that would be marvellous!! Hi guys, new links in the post. Hey Simon thanks for the time and effort put into presenting this great LP !!! Mannnn your amazing! !! Thankz Simon! Thank you very much! Never knew this existed. How great that the track listing consists of interesting and not so obvious choices. Thanks for this, I remember the album back in the day, but for some reason I didn`t like live albums at the time. I now regret that and you`ve given me a chance to redeem myself. Thank you! I own this vinyl - and join in thanks with the others for your upload of this stellar rip. Don't mean just to leech, the quality on this is awesome to behold. Again, thanks! What a great album. Thanks so much! YES! I was one of the requesters earlier of a re-up, and hadn't checked back here lately so I'm so glad I did! I too have this on vinyl, but can't wait to hear it on iPod and in high quality. THANK YOU for this, Simon! Thank you so much for this collection. Incredible music & good quality uploads. Thank you for your wonderful work, from South Africa. Wow. Never knew this existed until now. Thanks so much for sharing! jost copped this in 2018--- album banger! Just discovered - Thank you!